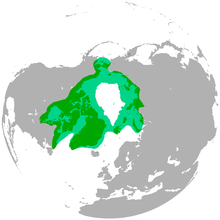 The polar beir (Ursus maritimus) is a carnivorous beir whase native range lies lairgely within the Arctic Circle, encompassin the Arctic Ocean, its surroondin seas an surroondin laund masses. ↑ Phipps, John (1774). A voyage towards the North Pole undertaken by His Majesty's command, 1773. London: W. Bowyer and J. Nicols, for J. Nourse. p. 185. This page wis last eeditit on 9 Apryle 2017, at 01:25.